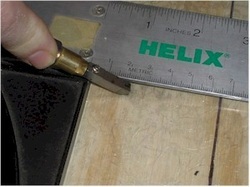 When using a straight edge, I often like to pull the glass just to the table edge so that the t-square fits right over the edge of the glass. I'm right handed, so I use my left hand to hold the straight edge against the far edge of the glass. 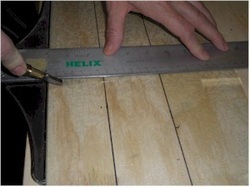 I angle the cutter so that there is a lot of the surface of the cutter. 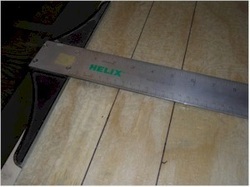 The angle helps the cutting wheel achieve a smooth score. If I held the cutter up in the normal position, the cutter would bounce and rattle along the straight edge, leaving a rough score line. 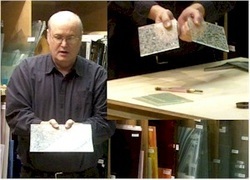 When cutting a large sheet of glass, I often use the table edge to break the glass so that the score breaks cleanly. 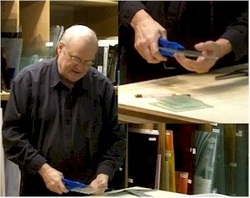 Another method perfect for medium and small pieces, the glass is scored. Then I take the piece in both hands and rock my hands apart snapping the glass right on the score line. 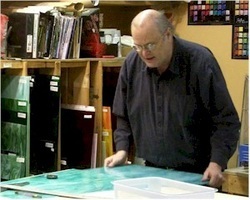 On small pieces, I sometimes smack the scored glass right on the edge of the table to get a quick break. Finally, when scoring long, thin pieces, running pliers work great. They are lined up on the score and squeezing them gives the same action as rocking your hands apart as earlier.